No matter the age, every bride deserves to feel like the ultimate princess on her big day. And when it comes to her hair, there are so many different routes to take. From natural to more glam, there’s really not a right or wrong when it comes to the day’s beauty. It’s all about the confidence the “prepping process” brings the blushing lady. Today, we’re showcasing 12 beautiful and elegant hairstyles for the Over 50 Bride. Of course, any one of these looks are versatile enough to work for any bride-to-be, but they all give a sophisticated push for our leading ladies that have lived a bit more life as well. Let’s take a peek at some of our favs and harness some inspiration! You can roll your hair into a romantic, vintage-inspired updo. Use hair accessories or nix them depending on how simple you want the overall look to go. The softness matches well with any bride and it has an easy, feminine quality that works for all women. Put a little texture in your natural locks and then create a healthy, updo with it. This blown back style reminds us of a Jane Austen novel. Make sure you let some tendrils fall around your face for an extra bout of romance. For an updo with a chicer finish, this low bun will do the trick. You’ll part your hair and use your side-swept bangs to your advantage. Again, you can add some accessories like a sparkling pin or headband or keep it a bit simpler. Here’s a low, side bun that we found really beautiful as well. Use your natural texture to add more interest to the look. We also find it rather charming for its old age spirit and quality; perfect for those going with more traditional or vintage-inspired looks. 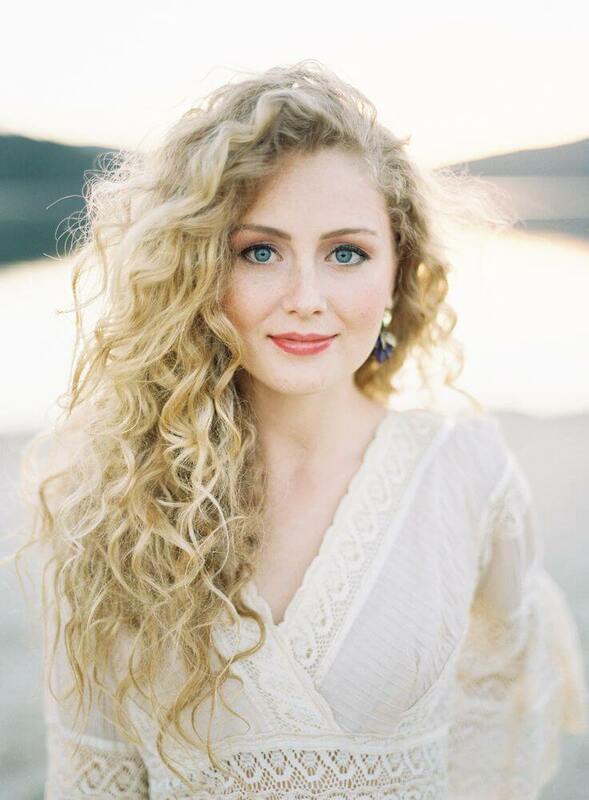 If you’re envisioning your hair down, think about using a curling rod to just add some soft waves. This is a beautiful look for those that want to add some hair pieces, veils, or even weave in some florals. It’s also an easy hairstyle to create on your own. This is a great look for those exchanging vows outside or at a quick and fun destination celebration. Simple ponytails can be just as bridal as the most intricate of updos. Straight, curled, braided, there are so many different routes to take – and this tousled look is a beauty. Curling irons aren’t a necessity for wedding hair. In fact, a natural blow out could be your ticket to your own bridal style. Delicate, long locks, straightened and sweet could be the best way to top off your modern ensemble. For those that want a bit of height added to their overall look, check out this beautiful bout of “mod” inspiration. This updo evokes the spirit of the ’60s in the simplest and most stylish of ways. If you’re looking for something on the sensual side, this is it. Sweet, vintage curls are always in. It’s a simple look that can be recreated really easily on one’s own and will always look great in photographs and with any length of hair as well. Whether your dress is modern or bohemian, this hair will top it off just right. A classic bun is a timeless choice. High like a ballerina or a bit lower for those that want something a bit softer, this look will never go out of style. Again, you can jazz it up with hair accessories or leave it as is. For those with shorter do’s – specifically spunky bobs – this look is flirty and fun! Half-up with a pretty headband brings a lot of spice to the bridal day ensemble. And it’s easy to do yourself as well when you don’t want to spend even more on a stylist. And finally, natural curls can flow freely! Whether you were born with the beauty or you have a perm, leave your locks loose on the big day. You can use a bit of product to refine the curls and tame any frizz.